A little misunderstanding over a big red button. (CNN) - When it comes to Russia, the Obama administration has been talking about “pressing the reset button.” It’s meant to symbolize a possible new start in U.S./Russian relations, which “crashed” after Russia invaded Georgia last August. So when Secretary of State Hillary Clinton greeted Russian Foreign Minister Sergey Lavrov in Geneva Friday before sitting down to their working dinner, she was all smiles when she presented him a small green box with a ribbon. Lavrov opened it and, inside, there was a red button with the Russian word “peregruzka” printed on it. "We worked hard to get the right Russian word. Do you think we got it?" she asked Lavrov, laughing. “You got it wrong," said Lavrov, as both diplomats laughed. A quick comeback – and recovery – from Clinton: "We won't let you do that to us, I promise. We mean it and we look forward to it." Ever the diplomat, Lavrov says he’ll put the “reset” button on his desk. A few minutes later, Clinton senior adviser Philippe Reines sent an e-mail message to reporters covering the Secretary of State. Hmmmm, alright, not bad...just don't look him in the eye Hillary! LOL!!! You'd think they'd have a translator on staff, or access to one, at least. Good thing they didn't accidentally come up with a dirty word, or something like that. I'm sure no one on this blog has ever made a mistake...you're all perfect, right? I think it's a funny story in an otherwise gloomy week. If they laughed...why aren't you? We are the ones that got the "overcharged" button. 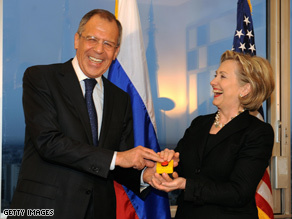 To hell with the typo, did nobody at the State Department think it was bad taste to photographically symbolize relations between the US and Russia with two foreign ministers pushing a red button......even as a joke? Guess it's a good thing "peregruzka" doesn't translate to "launch." What's the Russian word for "we-surrender-so-feel-free-to-invade-and- take-over-whoever-and-whatever-you-want-button?" Fire the fool who made that mistake. Wars can start over the wrong words. Ha haha!!! this is laughable and a bit side numbing. President Bush made huge flops everyday and he can't pronounce a simple word, yet I have seen a Republican wince at his misquotes. There must be mistakes in every corner and correction will always work as long as no pun is meant. The best minds can't get everything correct but since this was so important (the reset button) it should have been right. Chalk it up to human mistake and not a dumb or ignorant flip. After all the years Bush spent as President, he still can't pronounce nuclear. Glad they had a laugh over it. We all need a sense of humor. A little levity used to make a point. Way too subtle for the average Republican! No wonder they're getting worked up. Hillary is the only Obama's senior cabinet member who is doing a decent job. Obama's economic team appears still impotent with the bad economy we are in. Hillary is a breathe of fresh air, who is comfortable in eihter foreign palaces or poor villages. She was welcome by the Empress of Japan to her home during Hillary's visit there, and no other american secretary of state could have been given this privilege.